It’s no secret that the UK has become a hotbed for mobile app development talent. From London, to Manchester, Dundee, Edinburgh and beyond, the UK boasts some of the best iOS and Android app development talent in the world. Here at Kumulos, we’re obsessed with enabling mobile agencies to better manage the technical and commercial performance of their mobile app projects. Today we’re covering something slightly different and exploring the rapidly expanding and highly lucrative world of emerging technologies, specifically augmented reality (AR) and the agencies that are currently blazing an immersive trail across the UK. For the completely uninitiated, AR technology enables brands and agencies to develop applications that overlay digital information and 3D objects on top of the real world environment. In 2017, Apple released ARKit and Google followed suit quickly with the launch of ARCore. It’s now estimated that by the end of 2018, brands and developers will have access to over 1 billion existing Android and iOS devices via ARKit and ARCore. So if you’re a brand or business thinking about kick-starting a mobile AR initiative, there’s never been a better time to start. We’ve spent some time putting together a list of the best UK augmented reality development companies based on market positioning and track record. Mozenix is a Dundee based augmented reality company formed in 2017. The company focus on developing AR applications that enhance process efficiency and enable clients to successfully underpin wider commercial objectives. The company is currently working with Aberdeen based Visual Asset Management company Return To Scene (R2S) and a number of other clients to deploy high performance mobile AR apps for Apple ARKit and Google ARCore. You can read about Mozenix work with R2S on Energy Voice, ImmerseUK, AR Enterprise Alliance (AREA) and Oil & Gas Technology. If you’re interested in learning more about the companies position in the market, you can check out some of their content you can check out their pieces on ‘Top AR trends for 2018’ and ‘How to kick-start your first mobile AR development project’. Based in Northampton, Engine Creative are a leading UK digital creative agency that makes and develops AR experiences. They use their passion for emerging technology and 20 years of award-winning expertise to create marketing that entertains, informs, delights and inspires. Engine Creative are passionate about bringing brands to life online, on mobile devices and through augmented and virtual experiences. The company works in partnership with clients to help them creatively connect with their consumers on any size screen, in any location. By doing so, they are able to deliver unrivaled brand engagement for their clients. Engine Creative boast an impressive client list that includes companies such as Facebook, BBC, Tesco and Disney. With offices in London and Istanbul, Magnetic-London is a team of friendly designers and clever tech geeks. The company works with clients to develop AR apps (they’re also a full-service agency with a broad focus across mobile, advertising and web) enabling them to conceive, design and build effective AR strategies and campaigns. Magnetic-London believes that the possibilities with AR are limitless and provide a range of services offering ‘print to AR’ solutions for brands and businesses. This enables their clients to develop AR campaigns around business cards and printed promotional material such as brochures and leaflets. Their clients include Metaform and JLL. Harmony Studios are specialists in world leading solutions for both Augmented Reality and Virtual Reality. The company has produced award winning AR and VR applications that are used for a variety of purposes including training, visualisation, research and experiential events. Harmony Studios designs and develops custom applications for global brands across a variety of industry verticals including retail, pharmaceutical, industrial, gaming, automotive, travel, aerospace and more. The company believes that applications and use cases for AR and VR are growing rapidly (alongside the list of industries learning to embrace the technology). From creative design and modelling through to technical development and delivery, all of the work developed by Harmony Studios is produced in-house by their UK Digital Realities studio team. Their specialist approach has enabled the company to gain years of experience dealing specifically within AR and VR, meaning clients can rest assured knowing that they are collaborating with some of the most knowledgeable and creative minds in the industry. Follow Harmony Studios on Twitter. Apache is an industry-leading VR/AR development studio, with offices currently in London and Hertfordshire. Apache was originally founded 26 years ago on two simple notions: any sufficiently advanced technology is indistinguishable from magic, and when you witness magic first-hand, you never forget it. Apache creates highly immersive and dynamic AR and VR experiences, based on major motion picture and television IPs. The company has also developed a range of mobile AR apps for clients, as well as product visualisation & car configurators using a wide variety of AR focused SDK’s and toolkits. Their direct clients include the major Hollywood studios, such as Disney, Warner Bros, Fox, Paramount etc., as well as large corporates such as Microsoft and AOL, but they remain a small and tightly focused company, who always take great pride in the work they produce. Based in London, INITION is a technology innovation agency. The company specialise in the design and development of immersive, installation-based experiences, enabling clients to bring great content to new technology platforms including virtual reality, augmented and mixed realities, innovative interaction devices, specialised display screens, holograms and haptics. Located beneath their Shoreditch office, INITION’S Demo Studio provides a glimpse into the future of emerging interactive technologies and a showcase of their work. INITION design and develop apps across a range of technology platforms including virtual reality, augmented and mixed realities, gestural interfaces, interactive installations, crowd games, haptics, robotics, web and iOT. Their clients include the likes of IBM, Vodafone and Adidas. Based in Guildford, Diverse Interactive are dedicated to the evolution of digital interaction. The companies production studio works to combine cutting edge experiential technology with creative innovation and forward thinking. Diverse Interactive deliver bespoke digital applications and projects that rewrite what’s possible in terms of immersive user experiences. The company specialise in Augmented Reality (AR) development and Virtual Reality (VR) experience creation, 3D simulations and visualisations, mobile apps and high impact digital activations. They invite their prospective clients to explore their world of digital opportunity and experience the possibilities that exist with Diverse Interactive. The companies clients include Skoda, Ribena and Waitrose. Follow Diverse Interactive on Twitter. Indestry create products and experiences that inspire, entertain, inform and educate using Augmented Reality and Computer Vision. Formed originally in 2011, the company has developed location-based and mobile products and experiences in over 40 countries for the world’s leading entertainment and education brands. Companies and institutions such as National Geographic, The Smithsonian Institution, BBC, Universal, 20th Century Fox, WWF and numerous others have chosen INDE to reimagine how they speak to the world. The company believe that the “broadcast” of content to an audience is changing. Internet connectivity inside and outside the home (IoT), advances in consumer software and hardware availability, and the push toward interactive, three dimensional real-time communication and consumption have created opportunities both to disrupt existing markets but also create new segments within them. Augmented Reality and Computer Vision provides a unique opportunity to create a new generation of holographic digital learning and entertainment products that fundamentally change how society interacts with 3D content. Follow Indestry (INDE) on Twitter. Atticus Digital design, create, and develop bespoke AR applications to deliver to customers, clients, or staff. Using the latest SLAM (Simultaneous Localization and Mapping) technology, Atticus Digital can allow users to view 3D objects in real world spaces without markers. The company take a different view of the AR market, suggesting that Augmented Reality (AR) is an overlay of virtual content (images, videos, etc.) over the real world through the use of a smartphone or tablet. Traditionally, specific images or markers would trigger the virtual content but AR can also be triggered by GPS location. Markerless AR uses the very latest smartphone technology to accurately map rooms or other spaces and track 3D objects into that environment. Although still experimental, Apple’s ARKit and Google’s ARCore will be key to this rapidly expanding market. Follow Atticus Digital on Twitter. So there you have it. If you’re a brand, business or investor thinking about mobile AR and what it means for your business, we’ve crunched the key numbers to bring you the best augmented reality companies in the UK. 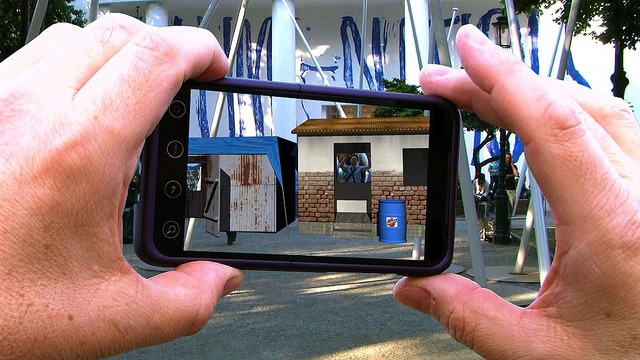 If you’re new to the world of augmented reality, knowing where to start can be challenging. Did we miss your favorite company? Be sure to leave a comment below or reach out to us on social media. There’s a ton of factors to consider when exploring how AR might impact your existing desktop or mobile software offering. Designing and developing AR apps requires a completely different approach to traditional 2D mobile app development. So if you;re considering engaging an agency for your AR project, it’s worth opting for a specialist company who possess a dedicated focus on AR and emerging technologies. And – not to pat ourselves on the back here too much, but if you’re looking to develop an augmented reality project, we here at Kumulos are more than happy to help. We offer a full SDK for the Unity platform with a built in connection to our industry leading mBaaS backend, as well as comprehensive analytics. Why not sign up for a 30-day free trial? In the small off chance we can’t help you, we have a full list of developers and agencies located across the globe who can help your reality augmented to the next level!